Massachusetts has an over two-hundred-year connection with the Rainbow State. Back in the early 1800s, missionaries sailed from Boston to Hawai’i, determined to convert the locals and also to bring the wonders of print to those distant shores. Along with religious fervor, the missionaries also brought a second-hand printing press, kickstarting an impressive outpouring of printed material in Hawai’i. On November 9, Skinner’s Auctioneers and Appraisers welcomes the public to its Boston Gallery at 63 Park Plaza to learn more about the Bay State’s early involvement in Hawaiian printing. 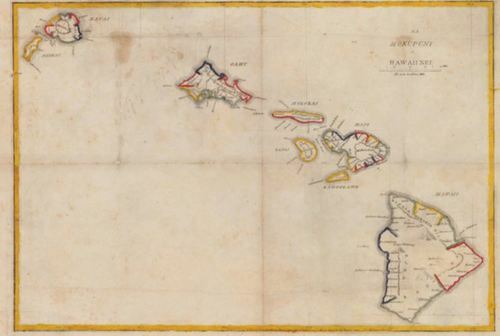 Elizabeth Watts Pope, curator at the American Antiquarian Society in Worcester, will be on hand to discuss Hawaii’s printed history and share items from the AAS’s collection of over two hundred books, pamphlets, bibliographies, newspapers, and engravings written in Hawaiian and other Polynesian languages. A highlight of the collection includes an 1838 copperplate engraving of Holden, Massachusetts, done by a self-taught Hawaiian engineer who never left his island home. Watts will discuss these and other items, why missionaries excised the letters ‘B’ and ‘D’ from the Hawaiian language, and how one of the strongest collections of early Hawaiian printed material wound up in Worcester. Image credit: Na Mokpunia o Hawaii Nei. Courtsey AAS. Massachusetts has an over two-hundred-year connection with the Rainbow State. Back in the early 1800s, missionaries sailed from Boston to Hawai'i, determined to convert the locals and also to bring the wonders of print to those distant shores. Along with religious fervor, the missionaries also brought a second-hand printing press, kickstarting an impressive outpouring of printed material in Hawai'i. On November 9, Skinner's Auctioneers and Appraisers welcomes the public to its Boston Gallery at 63 Park Plaza to learn more about the Bay State's early involvement in Hawaiian printing. Elizabeth Watts Pope, curator at the American Antiquarian Society in Worcester, will be on hand to discuss Hawaii's printed history and share items from the AAS's collection of over two hundred books, pamphlets, bibliographies, newspapers, and engravings written in Hawaiian and other Polynesian languages. A highlight of the collection includes an 1838 copperplate engraving of Holden, Massachusetts, done by a self-taught Hawaiian engineer who never left his island home. Watts will discuss these and other items, why missionaries excised the letters 'B' and 'D' from the Hawaiian language, and how one of the strongest collections of early Hawaiian printed material wound up in Worcester.